Learn the different styles to pair your palazzo pants with kurti. Discover the different ethnic outfit ideas for how to wear palazzo pants with kurta. A comprehensive guide on stylish ways to pair your kurti with palazzo for a traditional ensemble. Summers are here and so is the wedding season. We know you are right now stressing over how to keep up your style quotient up to the mark whilst coping up with the scorching heat. A true fashion diva knows how to blend elegant style with comfort. Why burden yourself under those heavy layers of ghagras or get uncomfortable in those figure-hugging churidaars when you can ditch them for a better option? There are different types of trousers are available to add to your wardrobe. Palazzo pants are the one of the trouser style you ought to swear by this wedding season. All you need to do is eloquently pair palazzo pants with kurti. You must have experimented with different styles to pair palazzo pants with western tops and formal shirts. But pertaining to the festive season we would like to cast light on the ethnic way of pairing palazzo pants with kurti. Right from the different types of palazzo pants to the different ways of pairing palazzo pants with long kurti we are going to discuss everything about the palazzo styles over here. Commonly confused as bell bottoms pants or culottes, palazzo pants are neither of it. Palazzo pants are a pair of wide legged trousers flared from waist till the ankle hem. This trend was started somewhere around the 60’s and underwent evolution from time to time. Not to forget the palazzo pants style has been a part of ethnic Indian clothing as gharara. When you learn how to wear palazzo pants with kurta, you’ll realize that the breezy and light-weight palazzo provides with an utmost comfort. From silk to chiffon and khaadi to denims, palazzo pants are available in all kinds of fabrics. All you need to coin the best palazzo outfits is to choose fabric according to the season and play around pairing palazzo pants with kurti. There are some styles which are known for its versatility, palazzo pants are one of them. To name some of the major palazzo styles, here are a few. The first one is regular palazzo pants, these are the ones with the straight cut. Second comes the extra flared ones, these come full flare and give a look of a skirt. The third one is the layered one, this type of palazzo pants have layers of fabrics. These styles of palazzos could be worn with kurtis. And, to understand which kurti and palazzo combination would suit your mood and body type, is why we’re here. Read along for different outfit ideas to pair palazzo pants with kurti. 5 palazzo pants with kurta outfits that are as chic as ever! Guess what is the best thing about the palazzo pants outfit? One can style palazzo pants in zillion ways and that is what makes it a closet must-have. That’s because the palazzo kurti design is pretty versatile. Pair it with a tank top for a bohemian appeal or pair it with a shirt for Friday dressing, palazzo pants are never going to disappoint you. Although, pairing palazzo pants with kurta have a complete ethereal charm. Adding to its elegant appearance also it makes you look slimmer when paired with a fitted kurta. Still to crack the puzzle of how to wear palazzo pants? The flared appearance of palazzo pants is far far away from your body silhouette. If you plan to balance your look by pairing your palazzo pants with a long kurti having fitted pattern, it is best advised to play with the colors. For a long kurti with palazzo pants combination, you can follow the monochromatic color theme to slim down your look or play with contrasting colors to make a bold appearance. A long straight kurti with palazzo pant can be really good option, especially since long kurtis are available in various designs in today’s day. The silhouette of the straight kurti with palazzo enhances the figure of the wearer, and gives volume below. It’s actually a perfect option for someone who is tall. 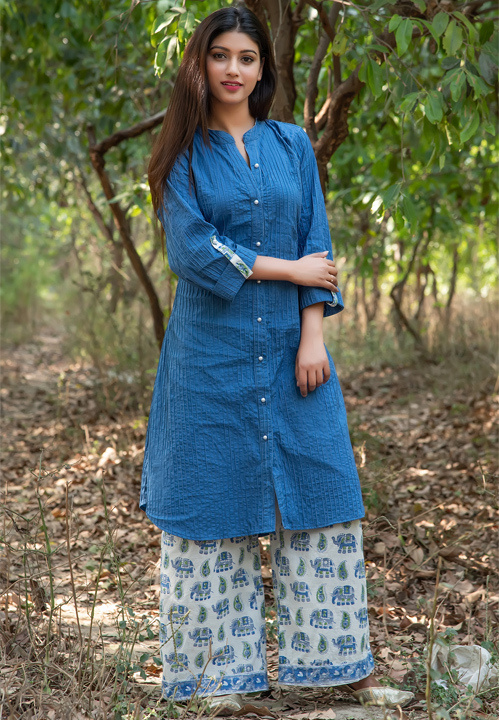 Also, if you are that artsy personality who loves to play with print patterns, your kurta with palazzo attire could do with a smattering of cute prints . A layered palazzo pant paired with a long kurti and a dupatta in same shade would make a great ensemble for a mehendi or a sangeet function. Who knows? Long kurtis with plazo pants might just become your go-to attire for every occasion. Let’s admit a cotton kurti is an invaluable fashion staple and no closet is complete without it. You have been slaying in a white cotton kurta teamed up with blue denims for years now. 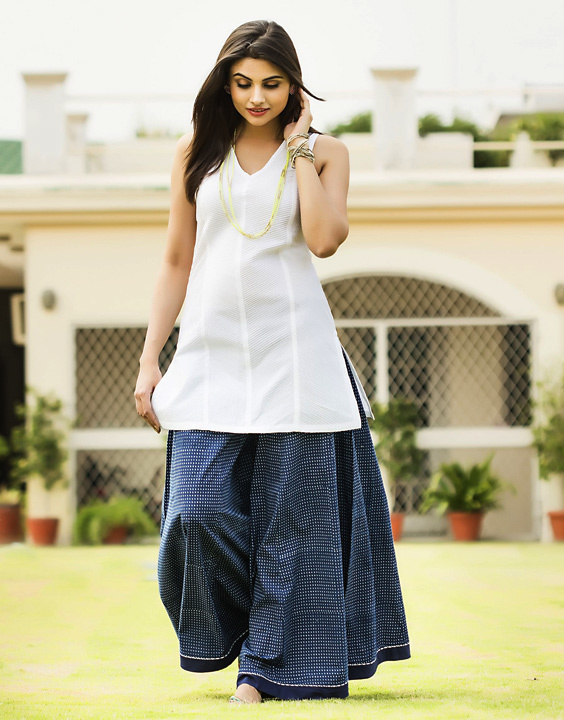 Ditch the denims for a change and opt for a white kurti with palazzo pants. This is truly a soulful combination as the color white is a very serene hue in itself. Summers are a season to play with all those pretty pastel shades. Grab all those cotton khadi kurtis in pastel shades and pair them up with cotton palazzo pants in similar color family to create elegant brunch ensembles. Accessorize with long earrings and give your long kurtis with plazo outfits a superb, ethnic twist! Interested to know how to wear palazzo with kurti if it’s slit fashionably on the front? Are you the one who is always up for experimenting with the fashion game? Well then spruce up your ethnic style just by adding a front cut kurti to your closet. Pair the front cut kurti with palazzo pants same shade and up your style game in no time. If you are planning to go for a simple and sleek look, pair the narrow palazzo pants and kurtis having a front slit. Complement the look with a pair of pump heels and slay your glam game. When you’re trying to ace the kurta style with palazzo, a chikankari or other embroidered ethnic fabric to create fusion wear could be very effective. Printed kurti with palazzo- Printed perfection! A little bit of print never harmed anyone. Prints are known to be adding the fun element to the ensembles then how could a palazzo be left without complementing these [pretty patterns. Palazzo pants with short kurti could be a good option for fashionistas who like their kurtis short and smart! Each print has a story to tell and that should be conveyed eloquently through your ensemble. How to wear palazzo with kurta for a date? For a romanticized appearance pick up a kurta with dainty floral print and pair it with a complementing pair of plain palazzo pants. For a traditional, look team a pair of neutral-shaded palazzo pants with bandhani or ikat printed kurta. After all, your favourite palazzo kurti design can be traditional, western or even indo-western. To flaunt the eclectic diva you are, team up your kurta with palazzo pants featuring an all-over quirky print pattern. Short kurti with palazzo- Some like ‘em short! What comes to your mind when you hear ‘bole chudia’ song from Kabhi Khushi Kabhi Gham? Kareena’s stunning pink palazzo with short kurti it is. When you plan for an evening function, plan for a pair of plain palazzo pants in as neutral shade and team it up with embroidered short kurti. Don’t go for an exorbitant palazzo kurti set just yet! Weigh your options first before plunging in a lot of money. 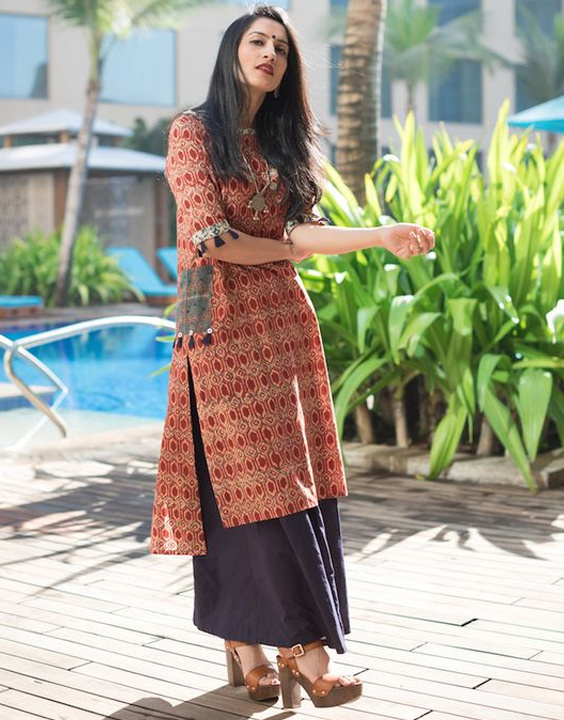 An uneven hemmed short kurta with palazzo can add a dash of glam to your look. On a hot summer day keep both style as well as your comfort quotient balanced with a sleeveless short kurti teamed with matching pair of palazzo pants. Wearing palazzo pants with kurti not only breaks the common rules of wearing churidaar and salwar but also makes an elite ensemble. Pair it with any type of kurti, be it long kurti, shirt kurti, front slit kurti or short kurti, palazzo pants can grace any ensemble with effortless ease. Palazzo pants with short kurti are in the style game for a long haul and not just a season. So it is advised to choose your personal favorites and make their way to your closet. And till the time you find those keep experimenting fearlessly with different palazzo styles.